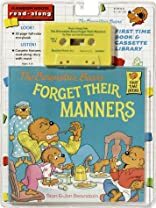 "When Mama Bear's efforts to improve her family's manners are unsuccessful, she devises a Politeness Plan--a chart listing a chore as a penalty for each act of rudeness. Basic etiquette is presented in a practical way. Berenstain illustrations add humor and understanding." --School Library Journal.